Social and financial crisis, specially the high levels of corruption that stifle institutions and an increasing number of unemployed and of badly employed people (people who have precarious jobs, who receive salaries that do not allow them to survive), has generated and is generating an ongoing discontent and despair on citizens who are encouraged to click and to participate into online polls, but without having opportunities to experiment a real engagement with matters of their interest, with issues that have a direct influence on their lives, provoking that words such as participation, development, or empowerment are invoking empty signifiers (Ninam 2015). Notwithstanding the radical transformations on different dimensions provoked by the extension in the access and in the use of new technologies and by the global interconnection of computers, mobile telephones, and other devices, in order to be autonomous in our judgements and choices, free access to information and transparency as conditions for individual and collective autonomy is still needed (Papadimitropoulos 2017). Access to information and transparency are mainstream requirements for people to progress depending on their effort and their capacities. Access to information and transparency are core elements for allowing people to accomplish a social change to live worthily. Social change must be understood as the possibility for people and for groups of people to improve their life conditions. Social change must be approached as a criteria and as an objective which has utterance in the possibilities that people has for at least, having a salary that permits them to afford the minimum requirements that a human being needs: a roof, food, heat, light, and water. Further, social change must be granted by public institutions because it is the skyline that motivates people to continue in the effort. Without possibilities for social change, society will be more unequal and corrupt. In a context of profound social crisis and ongoing social differences and in a context where political parties situated within extreme right are conquering the helm of the governments, communication but also communication research and, specially, academic communication research can do much for humankind. Communication research is mainly focused on studying issues related with mass media. In this line, according to several investigations (Cáceres and Caffarel 1992; Martínez-Nicolás and Saperas 2011, 2016; Caffarel et al. 2017), for 25 years, Spanish communication research has been focused on “mass media contents.” We contend that studying media contents is still needed, specially the study of the impact and the routines of production of media contents because these are lines of inquiry which can provide clues for reshaping journalism in a moment where, as Mosco (2018) states, Facebook, with its 2.3 billion users, was in 2018 the largest distributor of news and information in history. However, apart from working within the cited lines of inquiry more focused on studying contents and uses of mass media and social media contents, it is possible for communication scholars to analyze environments communicatively, assessing whether they meet essential requirements for facilitating relationships among citizens based on equality and respect. This type of analysis is especially urgent in public contexts, spaces, and institutions funded by public money, but we can also apply it to enterprises because they are expected to comply criteria related with equal treatment to persons. For assessing environments from a communicative perspective, it is needed to transcend the consideration of communication as a linear process, approach from which aroused most of communication research, generating frameworks intended to identify the effects of media but also frames focused on relationships between communication and development, line of inquiry which generated diffusion and participatory models (Morris 2005), and also modernization and dependency paradigms (Tehranian 1991). In this chapter we are proposing a framework for conducting research intended on generating environments that enable social change. We based our proposal on a paradigm that approaches communication as a context for interaction and on two concepts: uneven development and recognition. As we already expressed elsewhere (Gómez Diago 2017), the idea is to conduct research aimed to analyze whether citizens can participate in contexts exercising their rights and their duties while enjoying opportunities for progress. The frame here proposed seeks to contribute to fulfil the need of a type of research attained to society and to humankind while being of help for building a critical approach claimed three decades ago by most authors of the articles included in two internationally recognized volumes specialized in meta-research in communication and published in 1983 and 1993, respectively: the volumes of the Journal of Communication Ferment in the Field, 33(3), and The Future of the Field-Between Fragmentation and Cohesion, 43(3). As we concluded in the dissertation entitled For Communication Research. 400 ideas from the last three decades and a proposal to update the interaction paradigm (Gómez-Diago, 2016a), most of the authors of these flagship volumes consider that research must solve social needs. More specifically, Melody and Mansell (1983); Mosco (1983); Grandi (1983); Mattelart (1983); Davis and Jasinski (1993); Tunstall (1983); Curry Jansen (1983); Schiller (1983); Stevenson (1983); or Monahan and Collins-Jarvis (1993) pointed out the importance of conducting research to understand and to solve social problems, claiming the need of attaining investigations to real world, thus to professionals, to associations of workers, to organizations of women, etc. To combat inequalities and to contribute to generate a society where citizens can progress according to their efforts, we need theoretical frames intended on assessing environments from a communicative perspective so it will be possible to study how interaction takes place between actors that shape the context under analysis while assessing whether relationships among them base on transparent procedures. Below we are introducing our theoretical framework composed by a paradigm (communication as a context for interaction) and two concepts (uneven development and recognition). Firstly, we will be introducing the paradigm proposed (Fig. 1). Kuhn (1962) understands theories as social constructs that carry historical traces of its creators, of the time, and of the place where were created. A paradigm embraces a theory as well as a number of assumptions that are taken for granted and influence the research process and the formulation of questions, defining the methods used, influencing the selection of criteria for deciding what is accepted as data while shaping the standards for assessing the legitimacy of the claims made. Differences between research traditions depend on economic, social, and political objectives (Melody and Mansell 1983). Technologies, their uses, and their regulation also condition paradigms. In this line, Chaytor (in Meyrowitz 2009) argues that mechanization of writing created a new space of authorship, intellectual property, reforming the literary style, boosting the birth of nationalist sentiment, and modifying the interaction of words and thought. A paradigm shift happens when investigators locate anomalies that they cannot explain by using the accepted paradigm (Kuhn 1962). Three decades ago, Rogers and Chaffe (1983) in the article they prepared for the volume of the Journal of Communication, “Ferment in the Field” and that is configured as a dialogue between both scholars, claimed that “source” and “receiver” cannot be distinguished in an interactive communication system, and they wondered whether a term like “participant” could adequately identify an individual member of a computer-mediated system or if the word “communication” modifies its meaning in the context of these new technologies. Rogers and Chaffee (1983) situate interactive communication as a historic turning point with respect to the one direction transmission model embedded on television, radio, cinema, press, and mass media, and the researcher considers that these transformations that unsettle society in several labels should motivate scholars to abandon his long dedication to the linear effects and move toward convergence patterns. The key element is, according to Rogers, the massively apparition of interactive communication and the role of computer as a type of communication channel and not only as a tool for obtaining data. Thirty-five years after, the Internet has modified many practices related to how citizens use and access information, as well as how they communicate, motivating, according to McQuail (2013), the need of new paradigms to overcome a linear conception of communication that does not reflect anymore how communication takes place. The loss of power of mass media as content filterers and the possibility that political actors have now for addressing citizens, without depending so much on the media, has debilitated the concept of mediatization (Schulz 2004), whereas the idea of interaction has been reinstated as useful device to deepen how contexts are communicatively built. Three decades ago, Melody and Mansell (1983) demanded to assess research in light of its ability to promote beneficial change, warning of the danger of focusing only on discrete static relations among individuals or atomistic organizational units. In a moment where research is needed that intervene on society and where new technologies have dramatically transformed communication, we are proposing to approach communication as a context for interaction. We will be introducing the paradigm that approaches communication as a context for interaction by outlining its epistemological basis. Instead of starting from a pre-defined concept of communication, this frame puts attention on how communicative elements give utterance to an environment. Considering communication as a context for interaction entails starting from the idea that communication cannot be an ultimate goal, but a context. 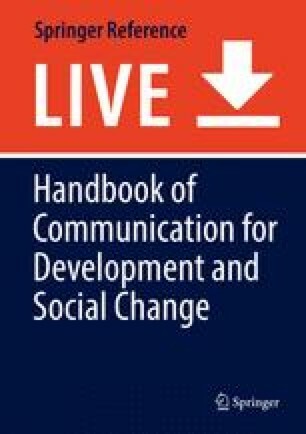 From this lens, we approach communication as dependent variable and as space (Gómez-Diago 2015, 2016a, b, 2017), making possible to assess issues such as the capability of an environment to promote equality between the actors that shape it; its ability to generate transparency; its capability to enable, generate, and promote exchange of ideas; its ability to motivate participation or to boost and encourage collective creation; etc. Besides understanding communication as a tool necessary for other scientific fields, in words of Shepherd (1989), it is mainstream for communication studies to analyze the ways whereby manifestations of existence (individuals and or societies) are communicationally constructed. Rothenbuhler (1993) emphasizes that, as well as political analysis or psychological analysis of the “communicating” problem is possible, it is possible to perform communicative analyses of psychology and politics. From an epistemological perspective, approaching communication as a context for interaction implies to understand communication as a mechanism that shapes social manifestations simultaneously at the individual and at the collective level, working as an articulating axis of societies. This approach overcomes dichotomies based on a more or less deterministic conception of the nature of man, such as superstructure/structure (Marx), systems/worlds of life (Habermas), or social actors/agents (Giddens), frames that approach communication as a bridge between two worlds, between two “realities.” Considering communication as a context for interaction implies adopting a holistic view to identify the actors and elements that intervene and shape what we are studying. From this angle, we do not worry much about analyzing communication, but about studying a context or situation from a communicative perspective. Below, we will be explaining two heuristics that we can use to apply the paradigm proposed: understanding communication as dependent variable and understanding communication as space. Most communication research followed a component-based approach where a source, message, channel, and receiver are variables, being modified to determine the consequences of this manipulation on the communication effects. Changes in the source, message, channel, or receiver are the independent variables, and the resulting communication effects constitute the dependent variables, largely provided by scholars from other disciplines such as political science, marketing, psychology, etc. As Krippendorff (1993) states, message-oriented research was conducted despite messages were not so obvious in these media. Within this context Lasswell (1948) proposed the formula “Who says what, in what channel, to whom, with what effect?”; Berelson and Lazarsfeld (1948) presented content analysis as an objective, systematic, and quantitative description of the manifest content of communication; and in 1948 Shannon and Weaver published the mathematical theory. None of these approaches regards at human participants as capable of constructing their own meanings, negotiating relationships with themselves or reflecting on their own realities. Rogers and Kincaid (1981) cite, as example of this type of research focused on effects, an experiment on the sources’ credibility carried by Hovland et al. on which researchers provided participants leaflets with equal content but with different types of sources. The aim of the research was to see whether participants had different perceptions depending on the sources cited but participants could not discuss among them, so the variable credibility was not allowed to vary in effects through their interaction. While communication research has mainly approached communication as a factor that influences other issues, communicational behavior as a dependent variable has been less studied. By asking on what forms of communicational behavior individuals depend, we can focus on communicative behavior while building a coherent discipline. One area that shifted toward communicative explanations is the subfield of organizational communication. Scholars within this area consider communication as the underlying constitutive force behind all organizational activities, structures, and processes (Koschmann 2010). Foucault et al. (2014) bring also a holistic communicative angle from which to investigate when highlighting the fact that when two individuals communicate, their communication models will depend on their characteristics as individuals at that moment but also on the history of their communication models and on the communication models of the members of the group. Approaching communication as a dependent variable is an appropriate starting point to carry research from a communicative perspective because we can focus on how different elements and actors generate different types of relations. Below, we are explaining what we do mean with the other heuristic proposed consisting on understanding communication as space. Recent developments in postmodern geography highlight the advantages of placing space as a construct of multiple and heterogeneous sociomaterial interrelationships that coexist and are affected. Approaching communication as space allows to focus in the capacity of communication for generating contexts oriented to different aims. This capacity of communication for giving utterance to environments has been multiplied with the spread in the use of new technologies of communication, especially of the Internet and of the possibilities brought by wireless connection because communication is no longer dependent on geographic locations. In this line, similar to the proposal of McLuhan, who identified that a global village emerged from mass media, Sassen (2012) posits that the circuits of interaction that formed through ICT-mediated exchange generate a new “layer” in the social order, something similar to a microglobal community. Contending that it is not a microglobal community but a lot of communities that have surged on cyberspace, we propose considering communication as space. From this perspective, we understand that communication functions as an environment while it gives form to it. Our understanding of communication as space resembles how Bakhtin approaches the concept of landscape. According to the scholar (in Folch 1990), space goes beyond the visual criteria that the geographer handles, turning into a continuous historical development that holds and destabilizes the “natural harmony” of a given region through an ongoing interaction between meanings created by a conversation. Researchers underline the need to understand communication as both an object (communicational event) and a lens or model (communicative explanation) of research (Vázquez and Cooren 2013). In this line, Friedland (2001) proposes to study communication ecologies to analyze how communities are communicatively integrated. The researcher refers to “communication ecologies” as the range of communication activities linked to networks of individuals, groups, and institutions in a domain of a specific community. Friedland (2001) considers that it is no longer possible to separate the social structure from communication, if ever it was possible and seeks to develop a perspective inspired by the one that was according to him the first serious attempt to fuse structure and communication: the Chicago School of Sociology. Similarly, Meyrowitz (1985) contends that what determines the nature of interaction is not the physical context but the information flow models, and he emphasizes that by changing the limits of social situations, electronic media not only give us faster access to events and behaviors but also provide new events and new behaviors. The researcher proposes to approach situations as information systems to overcome the distinction made between studies on face-to-face interaction and mediated communication studies, and he also proposes to see media as certain types of social environments that include or exclude, unite, or divide people in particular ways. In line with this last idea, we are introducing two concepts to apply the proposed paradigm consisting on considering communication as a context for interaction: uneven development and recognition. We chose these two concepts for building our theoretical frame because they are core concepts in what respect to humanity. Uneven development and recognition are in constant interplay; they are simultaneously cause and consequence. Uneven development is, most of the time, a consequence of a lack of recognition suffered by an individual or by an institution, and when there are a person or a group of persons that suffer uneven development, there are less opportunities for them to be recognized and, consequently, to have an opportunity to progress. Below we are introducing what we mean by uneven development and by recognition. Until 1970, the indices to assess development focused on quantitative measures that did not bother to perform comparative analyses. Poverty was associated with underdevelopment, and to be developed, countries should resemble developed countries in a context in which developed countries controlled the rules of the game. From this paradigm, the causes of underdevelopment are in the underdeveloped nations instead of being external to them or being produced by an interrelation of internal and external causes (Rogers 1976). Usually the line of inquiry Communication for Development and Social Change (CDCS) is cited as mainstream in attaching communication and social change, but this line of research encounters barriers when conducting empirical investigations because both terms (development and social change) convey different meanings depending on context, and therefore, applying an approach by using those concepts will mean to bring conceived ideas from one context to another making it difficult to deepen the features of the environments under analysis. Development is often associated with an interest on translating practices of capitalist environments than on achieving a comfortable situation for the majority of the population. In his line, Rist (2010) considers development as a toxic concept born without a little attempt to define itself while proposed as an unquestioned assumption. According to the researcher, the height of absurdity was reached when the Brundtland Commission (1987) created the concept “sustainable development” to reconcile the contradictory requirements to be met in order to protect the environment from pollution, deforestation, and greenhouse while ensuring that the economic growth was still considered a condition for general well-being. Rist contends that the essence of development is the general transformation and destruction of the natural environment and of social relations while increasing production of commodities (goods and services) geared, by means of market exchange. Because of the problems that motivate the use of the concept development, we propose to utilize the concept of uneven development, understood as a situation when development occurs unequally. The idea of uneven development is born within a comparative perspective that we can apply to assess countries and locations but also to assess situations of citizens. Harris (2007) points out that uneven development occurs by persistent economic differences in levels and rates across many different countries during a long time. Avdicos (2007) explains that from the 1980s and onward, Marxism had brought an epistemological and methodological lens for looking at uneven development from an angle that sees evolution of local trajectories through the spatial power relations in localities. According to Bieler and Morton (2014), Trotsky introduced the notion of uneven and combined development in his book Results and Prospects (1960), when analyzing the situation of disadvantage of Russia within the world economy. The researcher concluded that capitalist expansion is a result of the pressures of capitalist development on less developed countries. Van der Linden (2007) highlights one observation of Elster, who placed the theory of uneven development of Trotsky between two points of view from which history of world can be studied: (1) as the rise and decline of nations (Thorstein Veblen, Mancur Olson) and (2) as the rise and decline of institutions (Marx, Douglass North). We could add one third level of analysis which we are interested on covering from the frame here proposed: (3) the rise and decline of the lives of citizens. We can apply the concept of uneven development to evaluate how citizens live. Are citizens enjoying a progress in their lives in line with their effort and their work? Is taking place an uneven development? If this happens, why is it happening? In what contexts? Which are the manners in which citizens can progress? Are there criteria that allow people to progress? What criteria manage public institutions and private enterprises to integrate and to promote workers? Are similar criteria being used around the world? Related to the criteria used or not used for assuring the development of people, we propose the second concept on which we build our approach: recognition. We base on the theory of recognition of Honneth (1995) to build our framework for the importance of this concept to articulate a society where citizens can achieve what is worth achieving. Recognition is the baseline of communication and the most important criteria because without it, actors who give form to a context are in unequal position to contribute and, hence, to provide ideas and insights, to intervene, and to develop their interests and objectives. A society where citizens are recognized according to their efforts is a healthy society. Citizenry has the right to enhance their social conditions because of their education, their effort, and their work. When this does not happen, citizens feel as strangers and discontent appears. According to Honneth (1995), every subject is given the chance to experience oneself to be recognized, in light of one’s own accomplishments and abilities, as valuable for society. As the researcher acknowledges, this definition lacks specifics regarding the type of rights associated to individuals and regarding the mode of legitimating whereby rights are generated within a society. It is mainstream to identify the criteria that orient the social esteem because abilities and achievements are judged intersubjectively. Fuchs (2016) highlights that Honneth reformulates Hegel and Mead’s approaches by identifying three modes of recognition at society: (1) emotional support provided by the family and friends, (2) cognitive respect supported by legal rights, and (3) social esteem given by solidarity communities of value. The three forms of recognition are social conditions whereby persons can develop a positive attitude toward themselves because it is through the cumulative acquisition of basic self-confidence, of self-respect, and of self-esteem – provided by the experience of those three forms of recognition that a person can come to see himself or herself, as both an autonomous and an individuated being. Fuchs (2016) identifies forms of alienation/reification in society in three realms: economic, political, and cultural. Depending on the realm we are talking about, citizens can suffer work dissatisfaction, political dissatisfaction, and cultural discontent. We are including a table where the forms of alienation proposed by Fuchs are described by differentiating their consequences on four realms: subject (experiments, emotions, attitudes), intersubjectivity (social agency and interaction), object (structures and products), and struggles (Table 1). 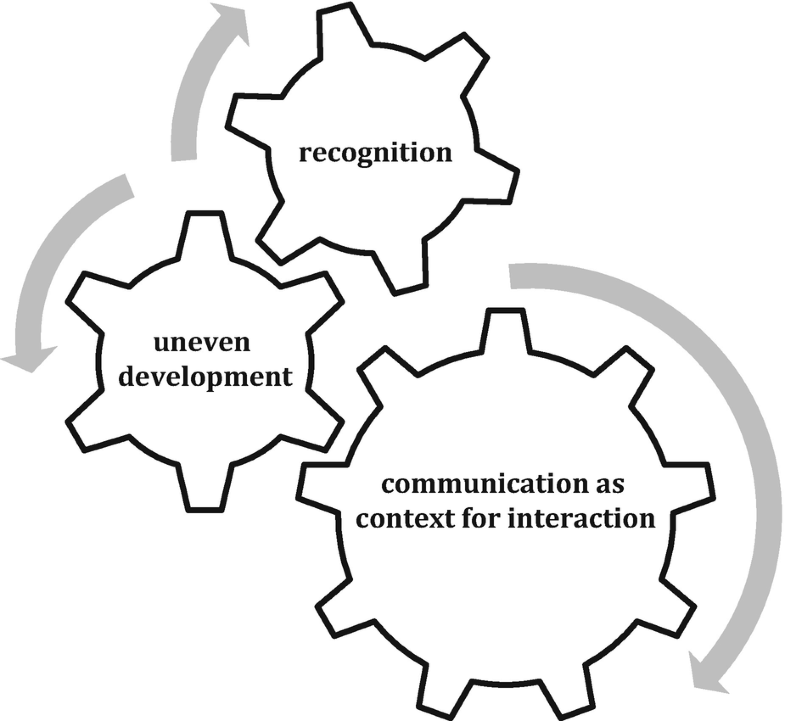 The situations of alienation identified by Fuchs (2016) are related to recognition, to uneven development, and to communication; thus, the contexts that give utterance to the three realms proposed by the researcher (economic, political, and cultural) can be evaluated from a communicative perspective intended on identifying how the actors involved interact among them and on studying how they interact with information or resources available. Fuchs’s approach is articulated around a conception of society as something opposed to the individual. From a communicative perspective, we can identify elements that produce and perpetuate alienation in the different contexts within they perform their lives. This perspective will allow us to identify which factors are those that contribute to generate more or less alienation, and it will enable us to detect elements to combat it. The field of communication should aspire to become what Compte wanted for sociology, the queen of the social and behavioral sciences. It fulfils one of the conditions, the object of study, because communication and information play a key role not only in all issues of life but also in the central theories and models of all relevant disciplines (Beniger 1993). The objective is not only to critically understand communication today, which is an important aim, but also to assess environments from a communication perspective. For doing this, it is needed to reverse the widespread tendency that says that researchers do not use a theoretical reasoning in Media and Communication Studies, lacking epistemological validity beyond bringing information for control purposes (Erdogan 2012). We articulate our framework in a time where communication research must renew its perspectives and methods to intervene on society to combat inequalities and to contribute to generate environments where countries and citizens are enabled to progress according to their efforts. It is mainstream to develop approaches to evaluate contexts from a communicative perspective oriented to assess interaction between the actors that shape environments and to evaluate how relationships among these actors are built. It is mainstream to put attention on how recognition is granted and to evaluate whether there are elements, rules, and procedures intended on combating uneven development. In contexts where information is denied or where information is used to benefit few persons to the detriment of others, recognition is directly bounded with power, occasioning uneven development and impeding social change for most of citizens. The grid brought here is dynamic and flexible for its capacity to integrate combined perspectives, so apart from the two proposed here (uneven development and recognition), it is possible to add more conceptual devices to assess environments communicatively. One possible concept to be added is citizen participation. Most of the definitions available of citizen participation are articulated through indicators usually referred to a context of collective action and of necessary protest (demonstrations, associations), to actions related to politicians (affiliations, communication with politicians, etc. ), or to the responses of the citizens to requests of collaboration from public administrations. We contend that when studying citizen participation, it is very important to take into account whether citizenry is reporting situations of abuse suffered in the contexts where they perform their lives and also to assess the nature of these complaints. Inquiring about these issues will allow us to deepen on citizen participation. It is necessary to put attention on complaints made by citizenry in the labor context and to the denunciations regarding the use of services. It is needed to investigate what types of complaints are being made and on what issues they are centered, as well as to identify the reasons why these complaints are not being made, if the case. In this way, we will know what citizens can do and what they cannot do and what they are doing. We will be in conditions to answer questions such as the following: Are there means for citizens to communicate with public institutions? For what? In which situations? It is needed to identify the existing shortcomings in a society where the economic and social gap between citizens is getting bigger. To investigate the genesis, characteristics and impact of citizen participation are a means to identify ways to delve into relationships between society, public institutions, media, political parties, governments, and policies, and it is also a way to identify interests, needs, and opinions of citizens. Social relationships always occur between citizens who have different assigned functions in social life, depending on the position they perform. It is essential to regulate relationships between citizens through transparent procedures and criteria, and it is necessary to spread the opportunities, the advantages, and the possibilities of development for the citizens. Further, when there is a lack of procedures and means to denounce, to progress, and to achieve, a social change is very difficult. Communication research can have a function in achieving healthy environments where social change is possible. The framework here proposed is a step in that endeavor.